Recent release “One-Niner”, from Page Publishing author Richard Stuart Lippert, is a searing novel recounting the horrors of war from the perspective of a man of faith trying desperately to minister to the spiritual needs of men who faced unspeakable tragedy nearly every day. Richard Stuart Lippert, a Minnesota native, former ordained minister in the Lutheran church and chaplain in the Fifth Marine Infantry Regiment, First Marine Division who served US troops in the Vietnam War in a combat battalion that had extremely high casualties, has completed his book “One-Niner”, a gripping and potent story of war and the human spirit. “One-Niner” is a thinly veiled autobiography recounting the experiences of a young Navy chaplain who served with the Marine Corps. His outfit—second battalion, Fifth Marine Infantry Regiment, First Marine Division—had among the highest casualties of any infantry battalion in the northern I Corps in 1968–1969. The unique perspective of a Marine infantry chaplain brings the excruciating images of war from the wards of field hospitals to the battlefield itself, giving the reader a comprehensive understanding as to why those scars continue to remain for the combat veteran forty to fifty years later. The chaplain, also known as “padre” or “sky pilot,” has a radio call sign, “one-niner” but carries no weapon and has no one to command. He lives with the “grunts” in the field and draws deeply from his own personal religious and psychological resources to bring spiritual comfort and emotional release to his Marines. Somehow, he makes sense out of nonsense and squeezes hope from hopelessness but is not immune from bullets and shrapnel or the insidious, debilitating assault on the human body and spirit that twelve months of daily, relentless warfare brings. His ministry is diverse, sometimes mundane, much of it dangerous as he travels daily to his four line companies by chopper or walking. Then in an instant, when rockets slam into their perimeter, primal fear screaming inside, the chaplain is hugging the ground, fearful he will die a painful death. Minutes later he is holding a bloody, dying Marine in his arms. Sometimes he feels deep pain and sorrow for them, like a mother grieving for her injured child. And sometimes, when too many casualties make the anguish too much to bear, he feels nothing at all. Although bullets and shrapnel will no longer cut them down, the combat veteran will face two battles returning home. First is the vociferous, angry political confrontation raging in America over the morality of the war. The second battle, much more difficult to deal with, will soon be raging in his head, those buried memories and horror of battle that will never, ever be excised out of his experience. Published by New York City-based Page Publishing, Richard Stuart Lippert’s book is a stunning work derived from the harrowing personal experience of a minister tending to the souls of men facing the very real possibility of a violent death each and every day. 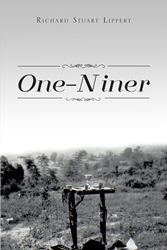 Readers who wish to experience this engrossing work can purchase “One-Niner” at bookstores everywhere, or online at the Apple iTunes store, Amazon, Google Play, or Barnes and Noble.